HBO's Luck has run out of it. The horse racing drama is no more after the euthanizing this week of a horse injured during filming. Two other horses met the same fate during production on Season 1 of Luck, which is currently airing on HBO. The latest tragedy occurred Tuesday while Luck was shooting a planned Season 2. Track scenes originate from Santa Anita Park in Southern California. "It is with heartbreak that executive producers David Milch and Michael Mann together with HBO have decided to cease all future production on the series Luck," the network said in a release issued Wednesday evening. 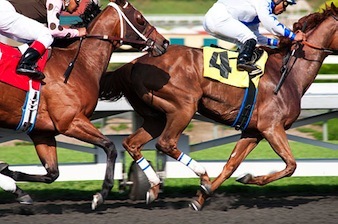 HBO said it had maintained "the highest safety standards throughout production, higher in fact than any previous protocols existing in horse racing anywhere with many fewer incidents than occur in racing or than befall horses normally in barns at night or pastures." But the network said it couldn't guarantee against future accidents and "accordingly we have reached this difficult decision." Luck marked Dustin Hoffman's first starring role as a TV series regular, with Nick Nolte also a part of the cast. Milch and Mann said in a joint statement that "the two of us have loved this series, loved the cast, crew and writers. This has been a tremendous collaboration and one that we plan to continue in the future." ***Fox has sent finalist Jermaine Jones packing after learning he had not copped to a previous police record while applying for the show. In a statement, the show generically cited "veracity issues and failing to disclose information." Fox reacted to an earlier report by tmz.com that said Jones twice had given false names to police and had a total of four outstanding arrest warrants for driving with a suspended license and "disorderly conduct with an open container." Jones is scheduled to plead his case Thursday on HLN's Showbiz Tonight, which airs at 10 p.m. (central). ***Whew. A Real Housewives of Dallas edition that had been in the casting/development stages has been stiffed by Bravo. Exec. VP of original programming and development Andy Cohen told zap2it.com Thursday morning that this particular concoction would be a non-starter. To which your friendly content provider adds, "Bravo." ***Hallmark Channel made a slew of programming announcements Thursday, including the premiere this fall of Marie!, a one-hour weekday afternoon talk show to be hosted by "international superstar" Marie Osmond. The network's executive vice president, Michelle Vicary, said that Osmond is "someone we all feel that we know, and the essence of who Marie is fits perfectly with the Hallmark brand to be emotive, family-oriented and celebratory." Osmond is, above all -- emotive. ***ABC has marked May 13th for the series finale of Desperate Housewives. And the network says that the premiere date for its syndicated Katie talk show, starring Katie Couric, will be on Monday, Sept. 10th. WFAA8, an ABC affiliate, will carry the show in Dallas. It likely will air at 4 p.m. weekdays.